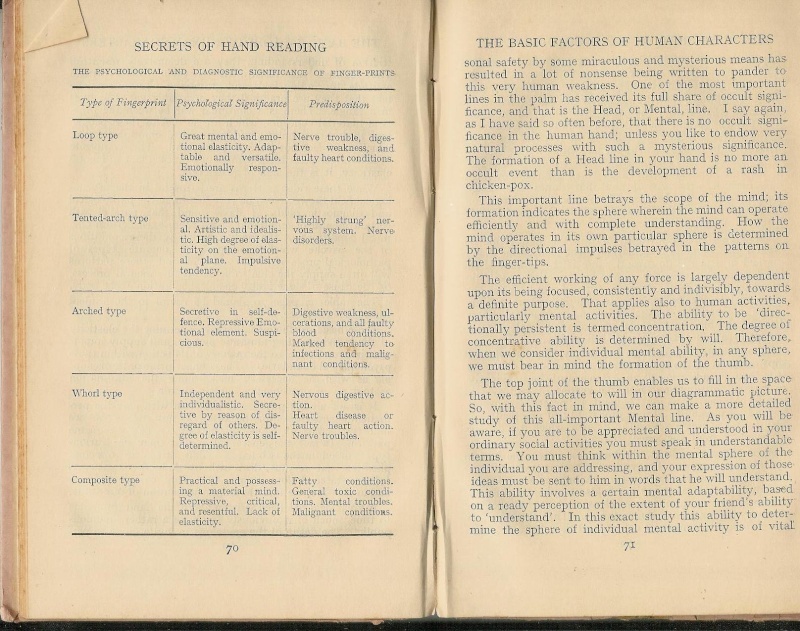 It is taken from "Secrets of hand reading" by Neol Jaquin. 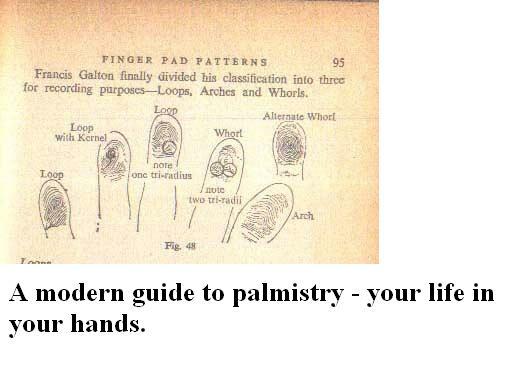 It is taken from " A modern guide to palmistry - your life in your hands" by Beryl Hutchinson. I found following website regarding this topic. asif amin wrote: It is taken from "Secrets of hand reading" by Neol Jaquin. Sorry, it's hard for me to respond... because in general I don't think that such 'lists' provide any inside on how hand reading really works...!! For example, I think it is simply unrealistic (+ unacceptable) when an author would relate the presence of 'loops' in general - without further specifications -... with 'faulty heart conditions'. ... Simply because far most people (about 95%) have at least 1 or more 'loops' in their hands!! However, Asif, I am not sure if your presentation provides an accurate impression from Jaquin's book - maybe it would be helpfull if you present here a QUOTE from your book where Jaquin describes his ideas about loops! Hi Martijin, in a first phase I am posting snap shot of Jaquin's book, in which I took reference, I think it is not visible as a snap shot but for surety purpose I can prove that this quote is present in this book which was mentioned by me. If you need full page snap shot I will paste it. It is my pleasure . Thank you for your pictures - though I would have believed you as well if you had only mentioned that the table which you presented in the first post... is actually a "quote" from the book! However, now that I know that the table was actually created by Noel Jaquin himself... 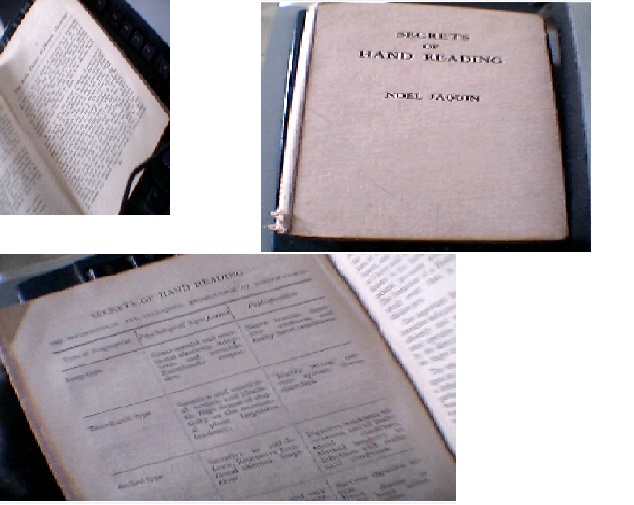 I must conclude that his theoretical framework should be recognized as an example of 'old' hand reading. I think it is simply not realistic suggest that any 'loop' pattern can be associated with 'faulty heart conditions'... and because this is obviously not a reliable statement at all, this actually raises doubts about the reliability of the other details in the same table. 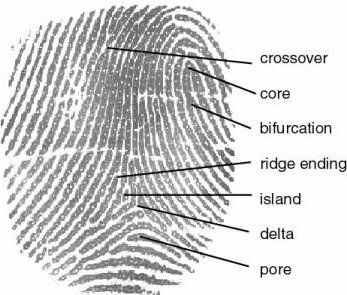 But more important: regarding the analysis of fingerprints... 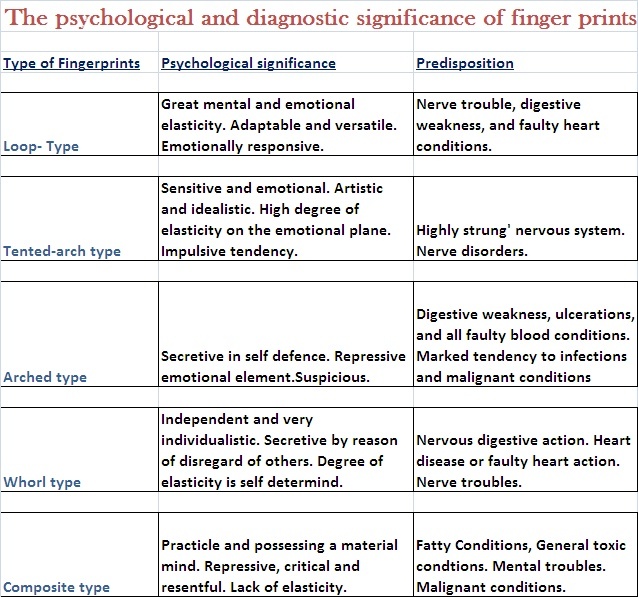 I think it is actually always necessary to consider on which fingers a fingerprint type is found. For, let's not forget that about 80% of people have a 'ulnar loop' on both of their little fingers... so it would be rather 'foulish' (!!!) to suggest that these are associated with disease. By the way, I am aware that quite a few people still have much more positive opinions about Noel Jaquin's work - though I agree that some aspects in his book are still useful (such as the many handprints that he presented in some of his books), but certainly not all aspects. But one has to be aware that his books were written many decades ago (the review says that his last book was written in 1958); so it should not be really a surprize that some aspects of Jaquin's work are 'outdated'. Asif, thanks for sharing... but I am wondering, what are your thoughts??? Martijin Thanks, I posted snap shot of page, If you need scan copy I will paste it. Yes agree with you, his work is outdated we should only take some examples from his work. For Martijin, scan copy of Jaquin's book. 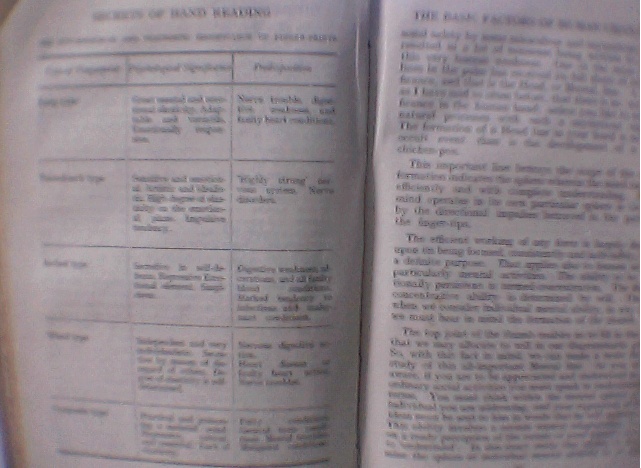 It is taken from Beryl Hutchinson book a modern guide to palmistry. In this thread, I would like to try to post finger prints as much as possible in order to one may easily recognize and judge its type. It would provide great help to general users and experts both. 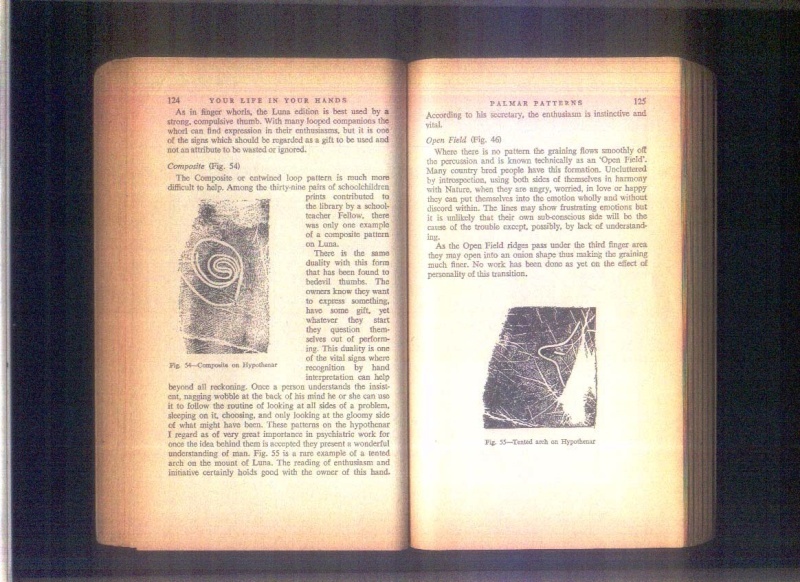 You might like to have a copy of "The Science of Fingerprints" from the US Dept of Justice in your collection. It doesn't give health or personality indications but is excellent in identifying the differences between double loops, whorls and tented arches etc. I also admire Jacquin's work and the direction he took hand reading. 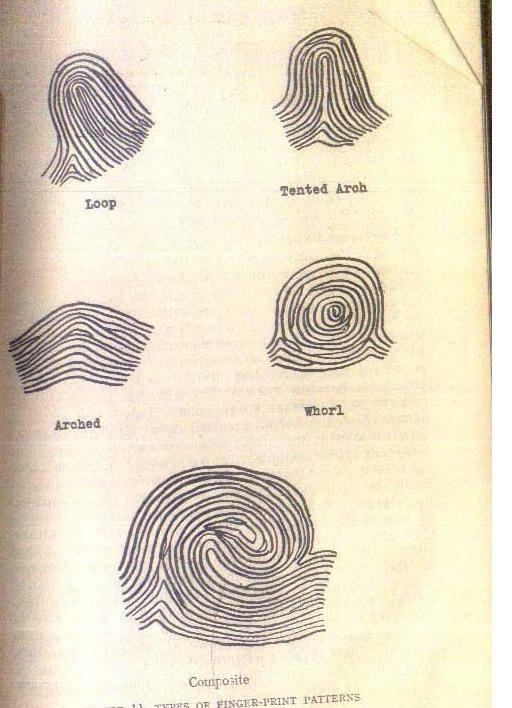 Jennifer Hirsch's new book "God Given Glyphs" is one of the best in the sense that it is quite detailed in describing each fingerprint on each finger. Thanks for recommendation and for encouragement. Thanks Martijin and Lynn both of you for free e-book's link..
Forensic scientists use many tools to try and solve crimes. For example bloodstain pattern analysis, DNA testing, forensic dentistry, even forensic footwear examination and good old fingerprinting. A new fingerprinting technique has just been developed which is capable of identifying a killer’s faint fingerprints left on a corpse. The method makes use of surface enhanced Raman spectroscopy (SERS). This involves firing a laser beam at a material, allowing its composition to be identified from the wavelengths of light scattered. The scientists which developed the technique, are now trying to build a hand-held SERS scanner for use at crime scenes.